Its simple really, swimming is life skill that all children should master as early as possible and keeping our company values of FUN, SAFETY and ACCOMPLISHMENT in mind we have created a program that provides your family with a great activity you can enjoy together. SwimTime was opened in Janurary 2014 by two local Kiwi guys, myself Steve Peterson and Shane Radonich. 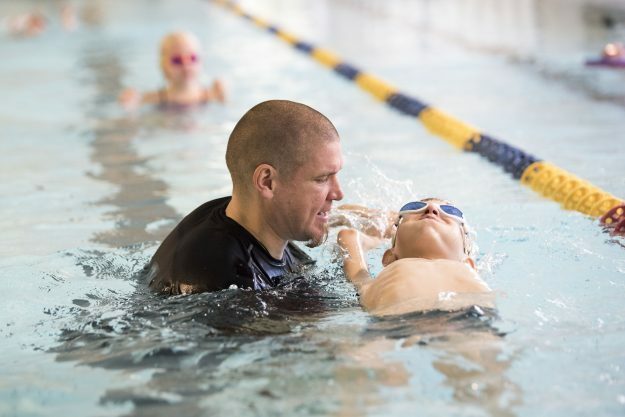 We have children in the area and wanted to use our skills to provide the local community with an activity they can enjoy as a family, and a system for learning to swim which meant that while at the pool our children are developing great skills. SwimTime is quickly building a passionate team here in Smålånd and is growing rapidly – We look forward to your family being the next to join the team. SwimTime will soon become the best time your child has each week! We offer a full money back guarantee if you are not happy after your first session with us so you have nothing to lose.